U.S. Congresswoman and DSA member Rashida Tlaib protests to stop the GM plant closings and re-tool the factories for green manufacturing. Photo: Joseph Xu. 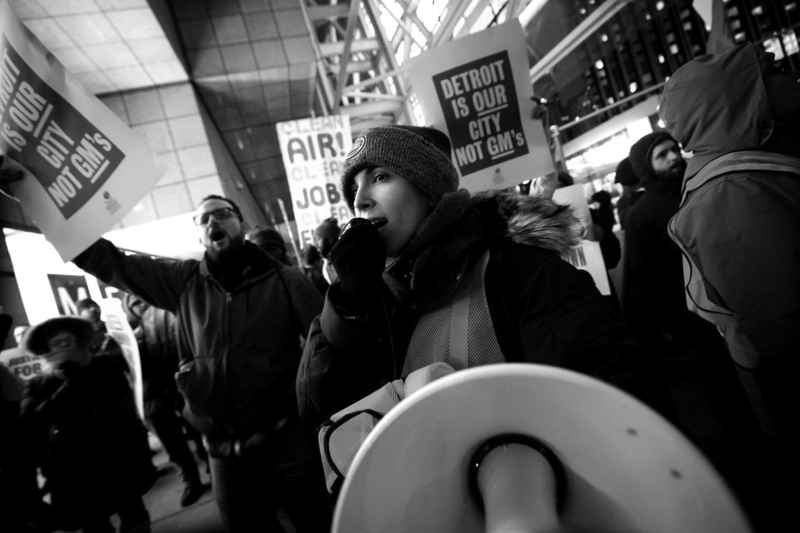 Detroit DSA’s mobilization around the Green New Deal started last November, when GM announced that despite earning record profits in 2018, it would be closing five plants in North America (including two in Michigan) and laying off 14,000 workers. GM also made clear that as part of its “global restructuring,” it would be discontinuing the Volt, a hybrid-electric car produced at the Poletown Plant as part of the 2009 bailout agreement. This clears the way for GM to focus on high-margin, gas-guzzling pickup trucks and SUVs, and reveals its commitment to a “zero emissions” future to be a sham. The response from elected officials was characteristically anemic. So in December, Detroit DSA organized a screening of the 1983 documentary Poletown Lives!, which tells how Poletown residents valiantly fought to save their neighborhood. Some 250 outraged Detroiters attended, including newly-minted U.S. Representative Rashida Tlaib, who is a member of Detroit DSA. Tlaib spoke on a panel alongside the film’s director and Sean Crawford, a Detroit DSAer who until this February worked at the Poletown Plant. Encouraged by our success, we set out to organize a mass action at the annual Auto Show Charity Preview, a ritzy event commonly called “Auto Prom.” We planned to protest GM’s criminal incompetence, its degradation of the environment, and its ceaseless efforts to roll back domestic auto production. But we also wanted to make clear that the problem wasn’t just GM and its “greed”—it was that the fates of countless people are in the hands of profit-seeking corporations. As elites in tuxedos and cocktail dresses attempted to enter the gala (without making eye contact), they were confronted by protesters shouting, “Make better life choices!” and “Which side are you on?” The chants were buoyed by DSA’s newly assembled Detroit People’s Marching Band, which provided a joyous sonic background. DSA members marched alongside rank-and-file UAW and Unifor (Canadian auto) workers, radical Brazilian unionists, students, and activists from a wide swath of community groups. Protesters wore yellow vests in solidarity with the gilets jaunes in France. Using the GM plant closures as a springboard to call for radical economic reforms in the form of a Green New Deal has struck a nerve in Detroit and around the nation. At least 20 articles were written about the Auto Show rally. 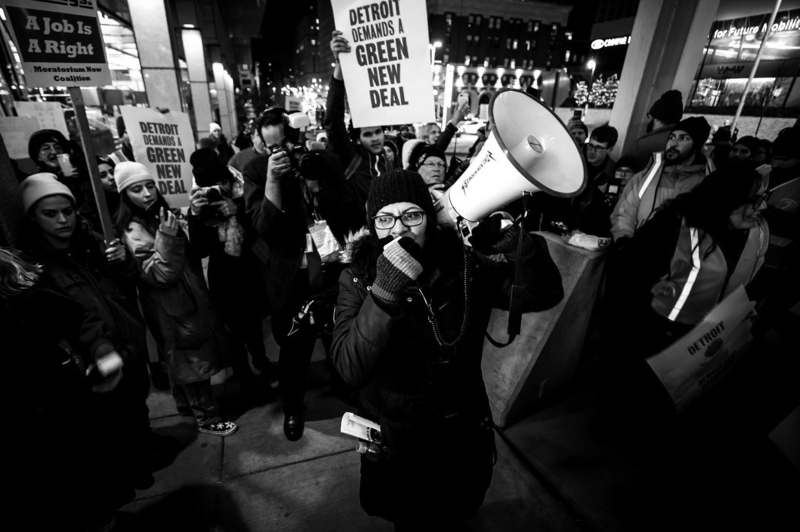 The action not only saw DSA strengthened as a force in Detroit politics, it gave rise to the Detroit Coalition for a Green New Deal, which is seeking public hearings around our demands. Detroit DSA will continue to organize around bold initiatives to “Make the Rust Belt Green” and put Michiganders back to work. We believe centering the Rust Belt—and Michigan and Detroit in particular—is essential to any package of green federal legislation. To that end, Detroit DSA, in collaboration with local elected officials and our coalition partners, is developing a proposal for a new federal agency called the Great Lakes Authority—modeled after the Depression-era Tennessee Valley Authority—tasked with building a just, regenerative, sustainable economy here in the Rust Belt. Such an agency would funnel federal resources (under local control) to large-scale green manufacturing, retooling of idled factories, generation of renewable energy, green infrastructure, environmental assessment and remediation, sustainable agriculture, protection of fresh water sources and ecosystems, and ecotourism. In so many ways, the ecological and economic apocalypse now being discussed as a motivator of a Green New Deal has already happened in the Rust Belt, particularly in Detroit, Gary, and Flint. No one in America needs a Green New Deal more than we do, and we are ready to fight for it. Natasha Fernández-Silber on the bullhorn at the Auto Show Charity Preview (also known a the “Auto Prom”), demanding a Green New Deal for Detroit. Photo: Joseph Xu. Natasha Fernández-Silber is co-chair of Detroit DSA.